David Bunnell staged the mutiny that started PCWorld—and he once famously wore a Chairman Mao suit to a company meeting. As we mourn Bunnell’s passing on October 18, PCWorld’s launch and the Mao stunt surface most among the editors who knew him. We’ve started collecting memories about Bunnell, and will add to this story as we reach out to compatriots who worked with David over the years. Bunnell and Cheryl Woodard put out the first issue of PC Magazine in January, 1982, only to leave later that year with most of the staff after the publication was sold to Ziff-Davis without their consent. With funding from our parent company, IDG, that staff started PC World (as the print magazine was then spelled) with founding editor Andrew Fluegelman. The magazine quickly grew to be a leader in technology journalism. Bunnell went on to co-found Macworld and other technology publications for IDG, and eventually left for other ventures. You can read more of our origin story in this excellent recollection from our 25th-anniversary issue, and you can read even more about David in his Wikipedia entry. I met David Bunnell in early 1981 when his girlfriend and future wife, Jacqueline Poitier, brought him into the word processing department of the State Bar of California as a temp. David worked on the Wang, while we worked on the new Lisa-like Xerox 860 machines. This was after David had left Personal Computing, and there had recently been nights when he had resorted to sleeping in Golden Gate Park. David may have been poor, but he had a grand plan. He always did. 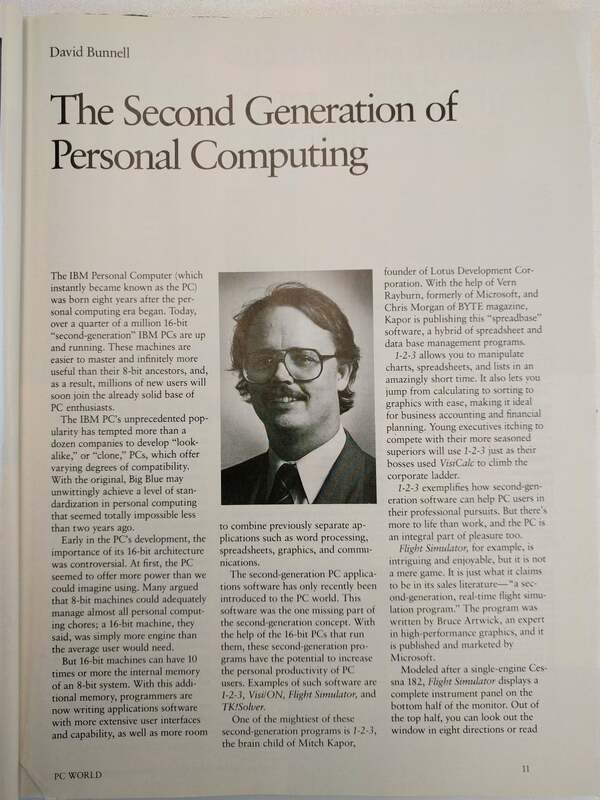 IBM was building a new personal computer, and he was going to launch a magazine about it. He told me to look him up the following year, and he would find me a job. 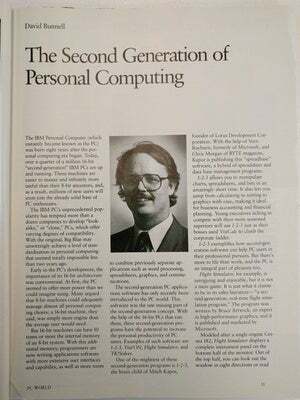 I joined PC Magazine in the summer of 1982. Several issues had hit the stands, and they were already as thick as phone books. I was in charge of entering copy from paper drafts into a cutting-edge PC XT with a 10MB hard drive, then coding and transmitting it to the typesetter over a new-fangled “modem.” It was something of a technological first, set up by Andrew Fluegelman. For some reason, my desk was set up outside David’s office, probably because he owned the computer and wanted to play with it after hours. It was the only XT around, and whenever I wasn’t working on it, our tech gurus Steve Cook and Karl Koessel were continually taking it apart and running tests on it. I met David in 1986, and I was hired, actually, when nobody knew anything. No journalists knew anything about computers, and no computer people knew anything about journalism. David Bunnell built up the walls between editorial and sales. I was very unsure of how to manage this very big and kind of crazy magazine that was growing like a weed and at the same time having enormous challenges. He expressed sincere confidence in me based on I’m not sure what, and he continued to do that when we worked together later at HyperMedia Communications. David was a challenging person in a lot of different ways. He got into a lot of little scraps with different people, many inconsequential, some very consequential. He had some big successes and big busts. But even today the one thing that really, truly remains is that he saw what people could do and he reflected that right back to them. David was the hippie who became the industrialist. At one point PC World had 13 competitors, and you almost couldn’t help but make money with a decent idea and a printing press. He took advantage. PC World was his little stroke of genius, and he had the good fortune to do it at just the right time with just the right people. Andrew Fluegelman was the driving force who got David’s idea really rolling. The mission of the magazines was to cater to readers with better-quality content and a better look and feel. It was easy to see all the schlock that was out. There were pretty thin walls between ad and editorial in those days. David took a stand, said we’re going to have more of a wall, not give happy-talk reviews. Karen Wickre: We had an all-staff meeting, and David decided to show up in a Red Army uniform to the meeting. The editorial people were all really crazy about him and felt like he was one of them, as opposed to, say, the business side. And this meeting sealed it for good or for bad. He kind of did a power-to-the-people thing. It was kind of a goof, kind of a joke, but he had a point. There was no protest, no walkout, but he was not liking the suits. Robert Luhn: At this big meeting, he strode down the aisle dressed like Mao. I thought, come on, David, but I can remember how David liked spitting in the eye of IDG. People were very loyal to David, or they did not get along—it was hard not to have one reaction or the other given the force of his personality. David was not just an editor who figured out the formula for what became computer product journalism but a man who very much wanted to influence that new industry. It was a small industry, and you could have huge effect as an individual—younger people will get a glimpse of that in “Halt and Catch Fire,” though the drama was rarely as made-for-TV as on that show. Eric Brown: I was continually inspired by Bunnell’s hyperactive leadership style. He was always trying something new, such as Windows Magazine and Publish. Sometimes that meant he would abandon us, like when he disappeared behind closed doors with Steve Jobs to design Macworld, but he always returned with fresh ideas. I followed Bunnell and Rich Landry to their NewMedia Magazine startup. In early 1995, we had just finished a CD-ROM version of NewMedia when David said we would pivot to the World Wide Web. As we struggled over how to design the home page, David walked in and said: “You guys don’t get it. The home page can have new content every day. Even every hour!” It seems obvious now, but it took years for many companies to grasp it. After hitting myself in the forehead with a “Doh!” I ran with it. David was always one step ahead. As I look at the picture of the founding staff of PC World, I am struck by how many of us who worked for David are still players in either the technology and journalism fields. When we were first hired on, we were all very young and didn’t really know what we were doing. But after building two very successful magazines together under David’s direction, his experience and passion became our experience and passion. Most of us stuck it out in publishing careers and many of us became very successful. We owe that to his influence. I met my husband, Eric Brown, at PC Magazine, where we worked together. In those days, David and Jackie were like a rock star couple. We invited them to attend our wedding and when they walked into the Archbishop’s Mansion on the eve of our wedding, everyone was in awe of their presence. To his staff, David wasn’t simply a successful businessman. He was a celebrity.